We are Worcester Bosch, Vaillant and Baxi accredited and can carry out anything from a simple boiler replacement to fitting a whole new central heating and hot water system in your extension or loft conversion. We can upgrade your existing unit or repair a fault in your existing boiler. Read more to discover why KT Gas is the No 1 choice for Claygate, Weybridge, Surbiton, Esher, Walton and the surrounding areas. We offer up to a ten year manufacturer’s guarantee on all Worcester Bosch boiler installations, seven years on Baxi and five years on Vaillant. We are the only local plumber to be officially accredited by all three major boiler manufacturers. We also offer 24 month’s additional warranty support on all workmanship related to your boiler installation – double that of our competitors. 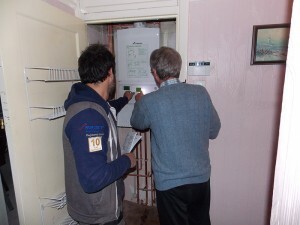 Upon completion of the installation one of our highly trained engineers will explain the operation of your new boiler. All of our boiler installations are conducted using 100% copper pipes and fittings. We do not use inferior plastic fittings on any of our installations. We have over 12 years of boiler installation experience. Step 1: Call KT Gas and book an appointment with us. Step 2: We will then visit your home at a time convenient to you and perform a detailed analysis of your system, measuring Kilowatt output requirements and water flow rate. Step 3: We will recommend a boiler that best suits your requirements and provide a detailed quotation. We will always stick to the fixed price of our quotation. Step 4: At a convenient time our trained engineers will thoroughly clean your existing pipework before performing the installation of your new A-rated boiler. Step 5: We thoroughly clean and tidy your property and show you how to use your new equipment. We use a top-of-the-range flue gas analyser to ensure your boiler is running safely and with the correct mix of gas and air. An incorrect balance can lead to carbon monoxide generation. We take a water sample to test the water quality of the system. We clean the magnetic filter and condense trap of the boiler. The failure of your hot water or heating system can be incredibly stressful. This is why KT gas has invested extensively in the largest stock pile of spare boiler parts of any local heating engineering firm. This massively increases the likelihood of our being able to fix your fault on our very first visit, as soon as we have diagnosed the problem. Our highly trained technicians are accredited with all three major boiler manufacturers, and we support any brand of boiler. In the unlikely event that a part required for your repair is not available from stock, we will still arrange to have your boiler repaired within 24 hours. KT Gas now offers finance that allows you to spread the cost of your boiler installation with an option of either monthly payments, or an interest free “buy now pay later” scheme. We also accept Visa and Mastercard credit cards with no surcharge, so you have the maximum possible flexibility when it comes to payment.